Whether you are a weekend warrior, a seasonal camper or your RV is your residence, "Going solar" can save valuable dollars for you too. A solar system for your RV offers the freedom to run lights, refrigerators, fans and electronics anywhere "under the sun", even, off-grid. This page of our site has been designed to provide details about, "Going solar" with your RV. Please let us know if you have questions or would like to schedule a consultation. Freedom - Now you can go off-grid in locations where energy resources may be limited. Quit - Shhh... Enjoy the silence solar has no sound. Convenience - Solar doesn't require fuel and is virtually maintenance free. Green Merit Badge - Solar will reduce your carbon footprint. Cost - Yes, there is an initial expense. However, your long-term savings will soon have it pay for your itself. "Going Solar" will offer better views, lower prices, easier availability and increased privacy in areas where hookups are not available. How about driveway surfing? You can now stay with friends and family without worrying about plugging into their home. Hopefully not, but if you by chance have a mechanical issue, no worries! You have solar power. Going solar on your roof means your batteries are charged whether you are moving or parked. The simple answer to this question is that it is all about size and wattage. For example, a 400-watt system can generate 2,000 watts. With that said, a 400-watt system can generate enough energy for daily use for weekend warriors and avid campers. 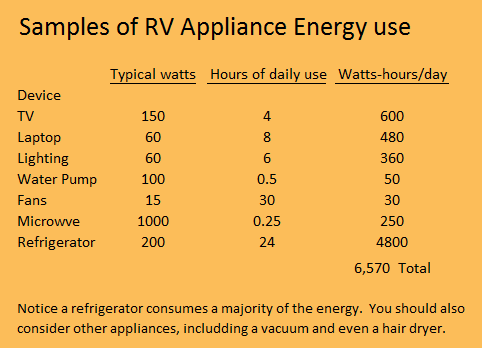 For anything more, a regular RVer might consider an 800 watt system. You will generate up to 4,000 watts, which is more than enough to run the majority of your appliances. Doubling the wattage means four additional panels and 1-2 additional batteries but your converter and inverter will stay the same. Consider how much you spend on a gallon of gas to power a generator. If you do the math, your system will soon pay for itself. We have also included a glossary of terms you should be familiar with. An AGM Battery or "Absorbed Glass Mat" battery uses plates, just like with lead-acid batteries. However, an AGM features a slim fiberglass mat that is saturated with battery acid between the plates so to pack internal parts. A charge controller limits the amount and rate of power to prevent the battery from overcharging. A Maximum Power Point Tracking or (MPPT) controller will go one step further by optimizing solar conversion in able to produce the best voltage for your batteries. Lead-acid batteries depend on a chemical reaction between battery chemicals and water in able to store. This process happens between plates that are sealed inside the battery. Lead-acid batteries are designed for cars, trucks, RVs and other vehicles. Lithium-ion batteries use a different technology than traditional lead-acid or AGM batteries. Lithium-ION batteries have chemicals that use one process for storing energy and another process for distribution. They are designed to cycle back and forth so to give the battery a much longer life than others. Modified Sine Wave is the technology of measuring the voltage passing from a DC power source through an inverter. At Wing Solar & Wood Energy, Inc. we realize that investing in solar is a significant commitment, especially when your investment is for a hobby or for your entertainment such as camping and traveling. However, when you travel you should be traveling in comfort without the hassle and stress of what it is costing you. Let our experts show you how solar can change the way you play. We hope this page has answered some of your questions. If you have further questions or would like to schedule a consultation with our client care specialist, please contact Wing Solar & Wood Energy, Inc. toll-free at 1-800-492-4061. For your convenience, you may also request more information from this site.